Kazimierz Sikorski was born on June 28, 1895 in Zurich. In 1919 he graduated from the Chopin Conservatory in Warsaw where he studied composition under Felicjan Szopski; in 1921 he graduated from Warsaw University (from the philosophy department). 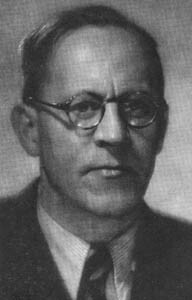 He also studied musicology under Adolf Chybiński in Lwów (now Lviv, Ukraine). In the years 1925-26 and 1930 Sikorski continued his music studies under Nadia Boulanger in Paris. For many years he taught composition and theory at the State Colleges of Music in Łódź, Poznań and Warsaw. He was the president of the State Colleges of Music in Łódź, (1947-54) and in Warsaw (1957-66). In the years 1953-59 he was president of the Polish Composers’ Union. Since 1968 he has been chairman of the Frederick Chopin Society. Kazimierz Sikorski was a distinguished teacher of several generations of Polish composers and at the same time the author of numerous basic theoretical and pedagogical textbooks in the fields of harmony, counterpoint and study of instruments, among them “Study of Instruments”, “Harmony” in 3 volumes and “Counterpoint” in 3 vols. He won numerous awards, such as State Awards in 1937, 1951 (of the Second Degree, for music to the Polish film “Warsaw Premiere”) and 1955 (of the First Degree, for his composer’s activity and his great contribution in the field of teaching), Polish Composer’s Union Award in 1951 and 1975, Prizes at the Polish Music Festivals in 1951 and 1955, the Commander’s Cross ‘Polonia Restituta’ in 1955, an Order of the Banner of Labour of the First Class in 1960, and Music Award of the Capital of Warsaw in 1960. In 1975 he received the doctor’s “honoris causa” degree of the State Higher School of Music in Warsaw (now F. Chopin Academy of Music). He was granted honorary membership in the Polish Composer’s Union and in several music societies, such as the Frederic Chopin Society and Warsaw Music Society.